I've completed up my Half Square Triangle Embroidered Mini Quilt. It finished at 12 1/2 x 13 inches. I'm so happy with these embroidered flower designs which I found in Kazuko Aoki's book, The Embroidered Garden. 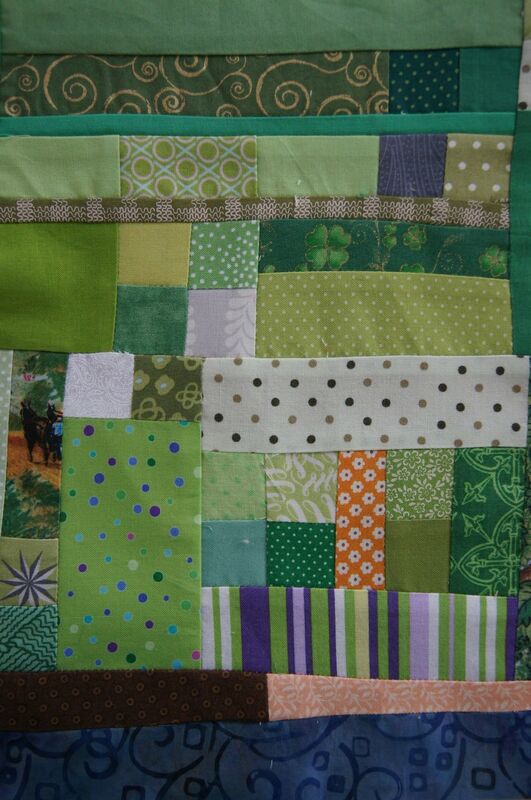 I really like the front of this little quilt. As I showed in my last post, some of the threads from the flower embroidery are hidden inside the the quilt. 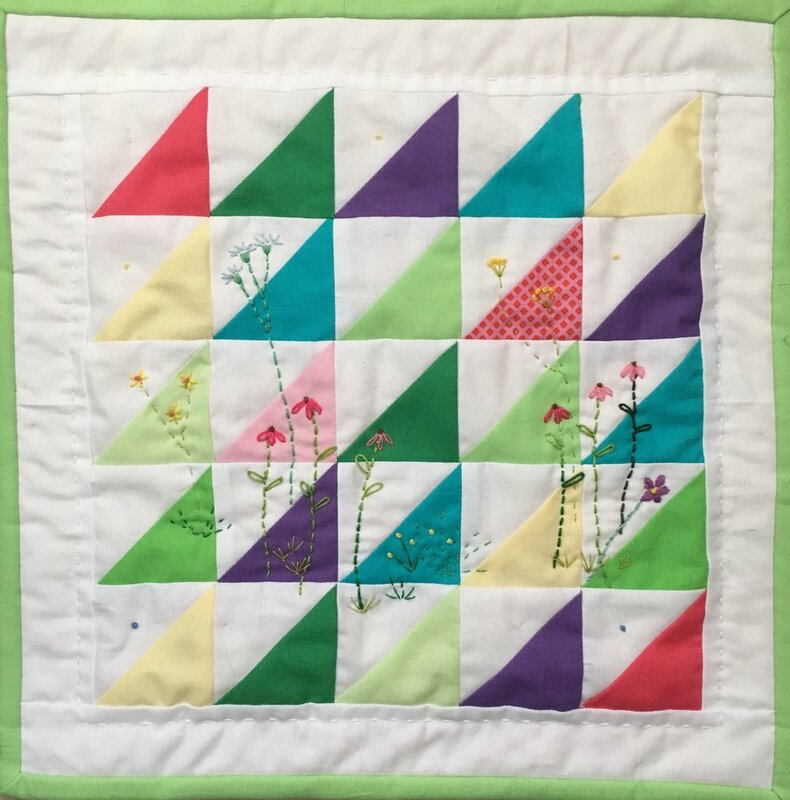 I wanted to use the flower stems as part of this little quilt's quilting. I used two stitches for the stems--the running stitch which has gaps between each stitch and the back stitch. The running stitch looks like quilting stitches on the back of the quilt. The back stitch really doesn't look good. I'm not unhappy about the back since this is a quilt that will be used as a wall hanging. But if I were doing it again, I'd just use a running stitch for all the flower stems. This weekend I went to a guild holiday party. There were some Christmas items in the gift grab but nothing for Hanukkah. I celebrate Christmas so the grab item I took to the party was my Selvage Christmas Tree Mug Rug. I realized the strip piecing I used for the tree mug rug could easily be adapted to make a Hanukkah Menorah. For this mini quilt I used strips of quilting cotton 1 1/4 inches x 3 inches for the 8 candles and 1 1/4 inches x 4 inches for the central candle. The background material is flannel. The strips between the candle strips were cut 1 x 3 inches. The horizontal strips just above the 8 candles, adjacent to the central candle were cut 1 1/2 inches x width needed for the line of candles. The other strips I cut to sizes that I thought looked nice. There is a single selvage in this mini quilt. It's the selvage from the striped quilting cotton. I cut the strip to show the numbers from 1 to 8 --the number of days of Hanukkah. The flames are pieces of felt. I glued a tiny square of the rough side of a hook and loop fastening material on the back of each flame to help it catch and stay on the flannel of the mini quilt. 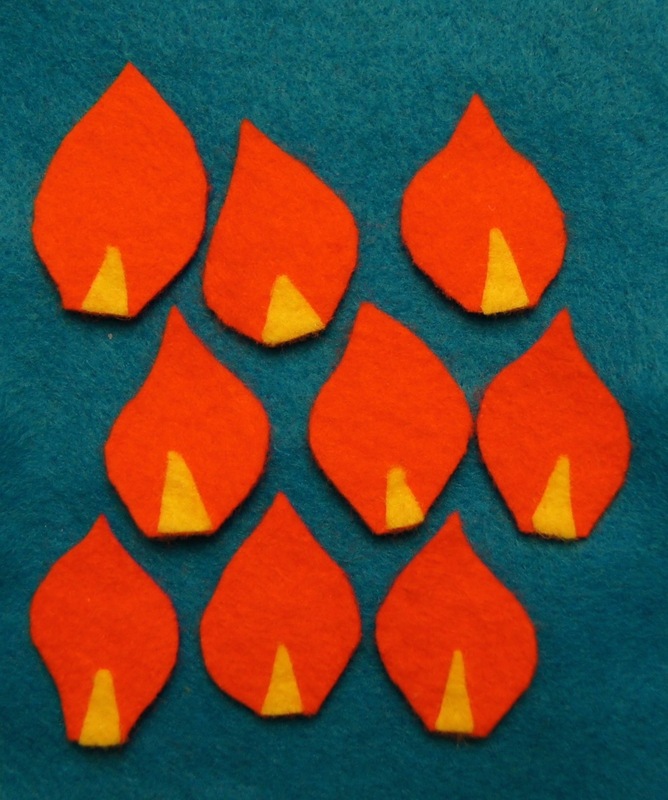 I put the flames on a piece of turquoise felt to keep them together until needed. With the quilting, this mini quilt is just stiff enough to stand on its own when placed upright in a slightly curved position. That was an unexpected bonus for this 9 x 15 inch mini quilt! What fun!